PBA Governors' Cup 2018 Updates & Results (October 3, 2018) Magnolia Hotshots Pambansang Manok(5-1) defeated Columbian Dyip(0-7), 113-95 to grab their fifth win in the 2018 PBA Governors' Cup on Wednesday at the SMART Araneta Coliseum. 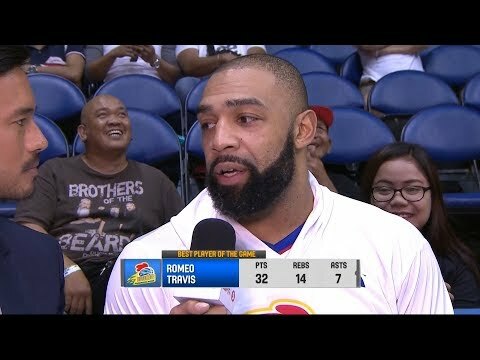 NBA superstar LeBron James of the Los Angeles Lakers hopped on social media few hours after the Magnolia-Columbian game on Wednesday to congratulate his close friend and high school teammate, Magnolia Import Romeo Travis' monster performance. James retweeted a post from ESPN5 on his 41.6M twitter followers including the hashtags #MidRangeRome #LuckyLefty . Travis led the Hotshots with 32 points (13/22 FG, 6/7 FT), 14 rebounds, 7 assists, and 2 steals in 38 minutes of play.